97 Trend Busters of which 25 are BUY signals and 72 are SELL signals. 162 Gap Signals -- stocks with upside or downside gaps or gaps that have been closed. 76 are bearish gaps and 86 are bullish gaps. Our Alert HQ signals are as bearish as they have been in months. The Trend Leaders list is significantly whittled down. SELL signals are outnumbering BUY signals two or three to one. Those few stocks with BUY signals, like Altera, are notable for swimming against the tide. Stock market performance has certainly been horrible these last two days and if you look at certain indicators, it appears the market is just barely getting into over-sold territory. 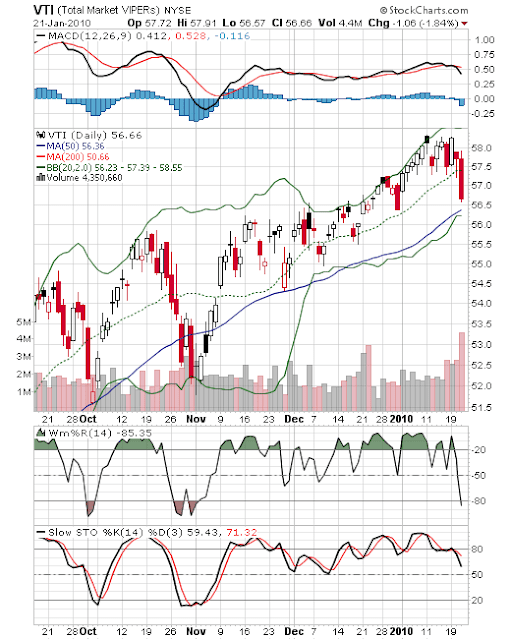 Here is a chart of the Vanguard Total Market VIPERS ETF (VTI). You can see that Williams %R has already fallen into the over-sold area but it looks like there is further downside to come. The Slow Stochastics suggest the downturn is just getting going. MACD is also bearish right now. All we can do at this point is hope the 50-day moving average holds. Even as earnings reports come out pretty decent, stocks have been falling. It appears that some kind of pullback will have to fully play out before we can expect markets to resume their up-trends. Let's hope it's just a pullback and not a full-fledged correction.